Driven by the guidelines that have risen from the program’s 2010 Strategic Planning and 2007 External Review, the program continues boundless efforts in collaboration and integration within the internal and external spine communities maximizing their impact in education and teaching, clinical care and research, as well as in advocacy and global outreach. The Spine Program is co-governed by the Divisions of Neurosurgery and Orthopaedic Surgery at the U of T Department of Surgery and is Co-Directed by Dr Michael Fehlings (Professor, Neurosurgery) and Dr Albert Yee (Professor, Orthopaedic Surgery). The program brings together abroad interdisciplinary array of clinicians, researchers, and educators focused on disorders of the spine and spinal cord. The Program is unique and draws from about 30 interdisciplinary faculty with areas of interest spanning the continuum from bench to bedside to community to include: Neurosurgery, Orthopaedic Surgery, Physical and Occupational Therapy, Nursing, Health Policy Management and Evaluation, Laboratory Medicine and Pathobiology, Biomaterials and Biomedical Engineering, Psychiatry, Radiation Oncology, Radiology, Medical Biophysics, Medical Imaging, Medicine, Molecular Genetics, Pediatrics, Physiatry, Injury Prevention, Pain Management, and a broad variety of relevant research and disciplines. Driven by guidelines that have risen from the program’s 2010 Strategic Planning and 2007 External Review, the program continues boundless efforts in collaboration and integration within the internal and external spine communities maximizing their impact in education and teaching, clinical care and research, as well as in advocacy and global outreach. The U of T Spine Program has been recognized by external reviewers as "the premier research and educational program for spine in the world”. This year the University of Toronto Department of Surgery Spine Program celebrates its 9th Annual Acedemic Day "SpineFEST". It has been a productive academic year as our program continues to foster important citywide collaborations within the university as well as participate and lead on several key regional and international initiatives. As a program, we benefit from the ongoing strong support of our University Department of Surgery, and Divisions of Neurosurgery and Orthopaedics. We value the clinical, research and education expertise of our citywide faculty and trainees in support of our important Program Council, Research and Education Committee activities. 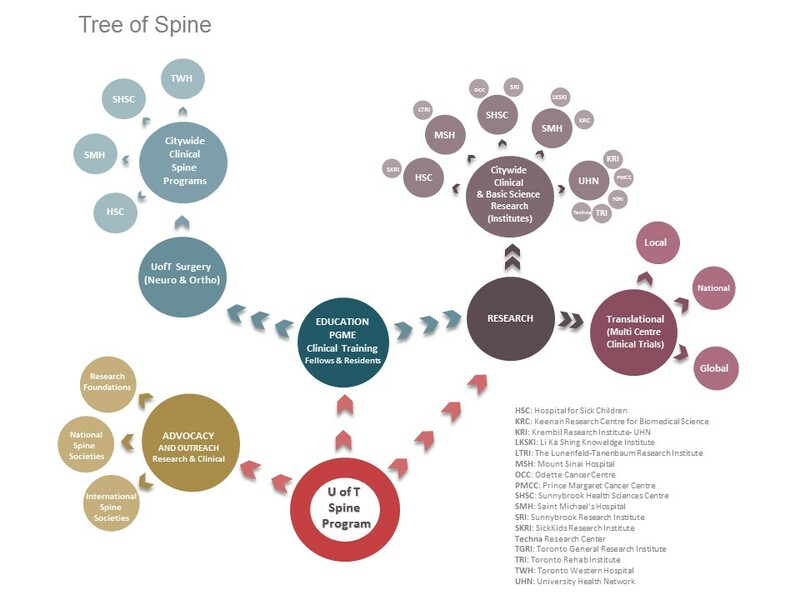 Key collaborators from spine community and industry also continue to help nurture growth in our academic program. In Fall 2016 the Program, in collaboration with the Krembil Neuroscience Centre, celebrated the 15th anniversary of the Tator-Turnbull Lectureship as we had an interesting and rather inspiring lecture by our visiting professor Dr Claes Hultling from the Karolinska Institute. Dr Hultling himself is a quadriplegic as well as an innovative rehabilitation physician and researcher. The Symposium was particular special with moving tribute to Barbara Turnbull and dedication of one of the spinal cord injury lab investigator offices, that belonging to Dr Charles Tator, in Barbara’s name. Dr Hultling also engaged us in stimulating discussions in our U of T GTA Spine Rounds as he shared with us his extraordinary passion for an extraordinary, yet a challenged life. This May, we have partnered the Ontario Neurotrauma Foundation, Canadian Spinal Cord and Ontario Spinal Cord Injury to conduct a successful combined meeting of Spinal cord injury and update about the clinical and preclinical spine research. In education and teaching, we have had an active year which continues to focus on excellence in fellowship and resident education. We held our third annual joint citywide Orthopaedics & Neurosurgery Royal College of Physician and Surgeon’s of Canada (RCPSC) Mock Oral Prep Course for senior university resident trainees. In particular, we acknowledge the significant contributions to the success of this meeting by our citywide spine fellows, led by Drs Jean-Christophe Murray, Kyle Stampe, and Mario Ganau whose time in preparation of the cases as well as valuable practical tips were well received by the residents. At the fellowship level, selective rotation/observership opportunities have been offered to incoming fellows over the past years, with some fellows choosing to pursue this added educational offering. Our fellowship education working group has initiated a successful two-year fellowship pilot with a second year focused on subspecialty of spine surgery. This opportunity builds upon competencies that may be acquired during a general first fellowship year, followed by a second year catered to advanced/focused competencies. This is also complemented by our citywide fellow surgical case-log program that is also based upon our national training competencies. Our Journal club has been accredited by the Royal College of Physician and Surgeon of Canada. We are pleased with our citywide clinical fellows who have taken on important leadership roles in organizing and hosting the journal clubs throughout the year. Many thanks to our fellows for leading the journal clubs; Dr So Kato and JC Murray have discussed interesting papers and cases on Cervical Spine deformity, also Drs Amit Kern, Kyle Stampe, and Gary Rosenberg facilitated exciting discussions on two sides of a study “SLIP” and their controversial outcomes. Special thanks to Dr Stephen Lewis for organizing an exceptional surgical skills course for our new citywide incoming fellows. The course was followed by a welcome dinner combined with research update meeting to expose our new fellows to our current cityside spine research project. We thank Drs Carlo Ammendolia and Karl Zabjek for organizing such a successful meeting. From a clinical research perspective, The Program continues to serve as an academic hub to foster collaborative efforts in facilitating international multi-centre clinical trials and data sharing agreement between the main hospitals. Among of which, the Riluzole in Spinal Cord Injury Study (RISICS) which is principally sponsored by AOSpine North America. RISCIS is launched to evaluate efficacy and safety of Riluzole in improving neurological motor outcomes of patients with acute spinal cord injury. The study is still accepting new centers worldwide and recruiting locally at TWH, SMH, and SHSC. The INSPIRE Study: Probable Benefit of the Neuro- Spinal Scaffold for Treatment of AIS A Thoracic Acute Spinal Cord Injury is also currently recruiting internationally, and locally at TWH and SMH, to evaluate whether the scaffold is safe demonstrates probable benefit for the treatment of complete T2-T12/L1 spinal Cord injury. We are also pleased with the success of the Lumbar Spinal Stenosis Study which has achieved the enrolment target. The study is to examine the improvement of walking in patients who undergone a comprehensive program including a twice-a-week therapy. On the side of Metastatic Tumor Research, the Epidemiology, Process and Outcomes of Spine Oncology (EPOSO), is set to determine the efficacy of surgery versus radiotherapy for the treatment of impending instability secondary to metastatic disease of the spine. SHSC and TWH have been high accruing centers for EPISO and recruitment is near closing. In patient care advocacy and global efforts, Drs Yee and Fehlings are working with AO Spine North America to more broadly disseminate knowledge gained from our national competence based training education efforts. In similar perspective, the Program co-hosted an international annual meeting with the Cervical Spine Research Society (CSRS) in Nov/Dec last year in Toronto with excellent showcase and representations from our program and local spine community. In a productive platform on the side of CSRS meeting, we also partnered with AO Spine International and Rick Hansen Institute to put forward implementations of the Guidelines we have developed in the past couple of years for Acute Spinal Cord Injury (ASCI) and Cervical Spondylotic Myelopathy (CSM). This comes as an initiative to enhance quality of care by establishing clinical protocols for management of patients with ASCI, and aid clinicians in evidence-based decision making based on recommendations for important and controversial areas of ASCI management. Interestingly, our “Time is Spine” concept, in which we stress on early surgical decompression to improve outcomes from spinal cord injuries, has been highlighted by the Spine Summit and Spine Universe, supported as AOSpine guidelines, and is being considered for teaching as AO principle. Our program continues each year to draw the Scoliosis Research Society traveling fellows and award winners. This year we hosted Dr Tushar Rathod as he spent his SRS Globus Medical Fellowship at TWH and SickKids, we will also be hosting an additional SRS award winner this November. We are very excite about hosting the Neurotrauma2018 Symposium in Toronto August 11-16 2018 at the Westin Harbour Castle Hotel. We are also looking forward to host the 2019 Global Spine Congress in Toronto in Spring 2019; a vibrant international spine conference which is anticipated to attract over 1500 delegates. On December 4, 2017 we will be conducting our Strategic Planning retreat and we are pleased to invite our program faculty and trainees to this meeting. The retreat will inform the strategic directions for our program over the next 3 years with focus on three themes which are central to the mission of the UofT Spine Program: fellowship and training; integration of clinical care and enhancement of clinical programs and inter-institutional translational research. In closing, we would like to thank all our program members and partners for their support over the years. We are privileged to benefit from the diverse and specialized expertise of our program members. We also thank Ms. Nadia Jaber, our program coordinator that has been instrumental in moving forward our collaborative agenda. We are very excited about our SpineFEST keynote speaker Professor Zoher Ghogawala from Tufts University School of Medicine. He is a world renowned neurosurgeon, researcher, and an engaging speaker. We invite you all to join us in welcoming Dr Ghogwala and learn about “The search for Truth in Spinal Surgery”. This year the University of Toronto Department of Surgery Spine Program celebrates its 8th annual SpineFEST meeting. It has been a productive academic year as our program continues to foster important city-wide collaborations within the university as well as participate and/or lead on several key regional, national, and international initiatives. Earlier this spring, we inaugurated the first edition of our program newsletter that provides the opportunity for us to highlight and recognize the ongoing accomplishments of our city-wide faculty and trainees. As a program, we benefit from the ongoing strong support of our University Department of Surgery, and Divisions of Neurosurgery and Orthopaedics. We value the clinical, research and education expertise of our city-wide faculty and trainees in support of our important Program Council, Research and Education Committee activities. Key spine community and industry collaborators have helped nurture growth in our academic program. Division of Neurosurgery Botterel Symposium, Toronto Western Hospital-University Health Network (TWH-UHN) hosting, with Dr. Shekar Kurpad from the Medical College of Wisconsin. Neurosciences Collaborative Program Distinguished Lectureship, TWH-UHN hosting, with Professor Jack Feldman from UCLA featuring neural networks involved in respiration. Sunnybrook Health Sciences Centre, Odette Cancer Centre, Radiation Oncology invited professor, hosted Dr. Mark Bilsky from Memorial Sloan Kettering Cancer Center who discussed the importance of separation surgery in Stereotactic Radiosurgery for the treatment of Metastatic Spine Disease. Professor Yu Liang from Jiao Tong University, hosted by Dr Henry Ahn, St. Michael’s Hospital (SMH). Dr Liang provided key perspectives of surgical techniques and research in minimally invasive MIS-TLIF for the treatment of spondylolisthesis. Professor Stefan Parent from the University of Montreal, hosted by Dr. Reinhard Zeller, Hospital for Sick Children (HSC), engaged us with discussions about predictive models of progression in adolescent idiopathic scoliosis considering 3D spine parameters. Dr. John Kostuik from John Hopkins-Baltimore, hosted by Dr Michael Fehlings (TWH). Dr. Kostuik captivated our attention with a fascinating talk about the history of spine deformity from ancient India to today. Tator –Turnbull Spinal Cord Injury Symposium, TWH-UHN hosting, was highlighted with a tremendous turnout to the keynote address about Spinal Cord Injury-induced Immune Deficiency Syndrome provided by our distinguished invited speaker Professor Jan Schwab from Ohio State University, Columbus. It was a memorable celebration of Barbara Turnbull’s legacy in advancing spine research and care. In education and teaching, we have had an active year which continues to focus on excellence in fellowship and resident education. We held our second joint city-wide Orthopaedics & Neurosurgery Royal College of Physician and Surgeon’s of Canada (RCPSC) Mock Oral Prep Course for senior university resident trainees. In particular, we acknowledge the significant contributions to the success of this meeting by our city-wide spine fellows, led by Dr. Mark Pahuta, whose time in preparation of the cases as well as valuable practical tips were well received by the residents. At the fellowship level, selective rotation/observership opportunities have been offered to incoming fellows over the last couple of years, with some fellows choosing to pursue this added educational offering. Our fellowship education working group is now planning a pilot fellowship project that leverages work conducted by members of our program (through the Canadian Spine Society) with a recent publication on competence objectives for fellowship training in Canada. This opportunity builds upon competencies that may be acquired during a general first fellowship year, followed by a second year catered to advanced/focused competencies. Our city-wide program has an established fellows surgical case-log program that is based upon our national training competencies. Our city-wide clinical fellows have also taken on important leadership roles in organizing and hosting journal clubs throughout the year (the aging spine, metastatic spine disease). Special thanks to Dr. Stephen Lewis for organizing an exceptional fellows surgical skills course, complemented by our semi-annual research update meetings organized by Drs. Carlo Ammendolia and Karl Zabjek. From a clinical research perspective, The Program continues to serve as an academic hub to foster collaborative efforts in facilitating clinical trials and data sharing agreement between the hospitals (UHN-TWH, SHSC, and SMH). Among of which, the Riluzole in Spinal Cord Injury Study (RISICS) which is principally sponsored by AOSpine North America. RISCIS is a worldwide multi-centre trial launched to evaluate efficacy and safety of Riluzole in improving neurological motor outcomes of patients with acute spinal cord injury. The Primary Spine Tumor Study, which has been initiated under the leadership of Dr. Arjun Sahgal, has also been brought under the umbrella of the Program as a randomized multi-centre trial and to be launched in Montreal and Toronto at SHSC and Princess Margaret Hospital. This will be a pivotal trial directly comparing conventional versus stereotactic radiation therapy in spine oncology. The Lumbar Spinal Stenosis Study, led by Dr. Carlo Ammendolia at MSH has been successful in completing recruitment and progression towards outcomes. This research is complemented by efforts to translate knowledge in developing clinical practice guidelines for spinal cord injury and cervical myelopathy. In patient care advocacy and global efforts, the Program has made an impact on several levels. Drs. Fehlings and Raj Rampersaud have been actively involved with provincial initiatives to enhance access to care and service delivery for patients with acute and chronic spine conditions. Drs. Yee and Fehlings are working with AO Spine North America to more broadly disseminate knowledge gained from our national competence based training education efforts. In similar perspective, the Program co-hosted an international meeting with AO Spine North America, AO Spine International, Rick Hansen Institute, and Cervical Spine Research Society to identify and develop guidelines for Acute Spinal Cord Injury (ASCI) and Cervical Spondylotic Myelopathy (CSM). This comes as an initiative to enhance quality of care by establishing clinical protocols for management of patients with ASCI, and aid clinicians in evidence-based decision making based on recommendations for important and controversial areas of ASCI management. Interestingly, our “Time is Spine” concept, in which Dr Fehlings stresses early surgical decompression improves outcomes from spinal cord injuries, has been highlighted by the Spine Summit and Spine Universe, supported as AOSpine guidelines, and is being considered for teaching as AO principle. We partnered with the Rick Hansen Institute (RHI) in their strategic planning meeting on Oct 24, 2015 to explore area of collaboration on registries and SCI research. 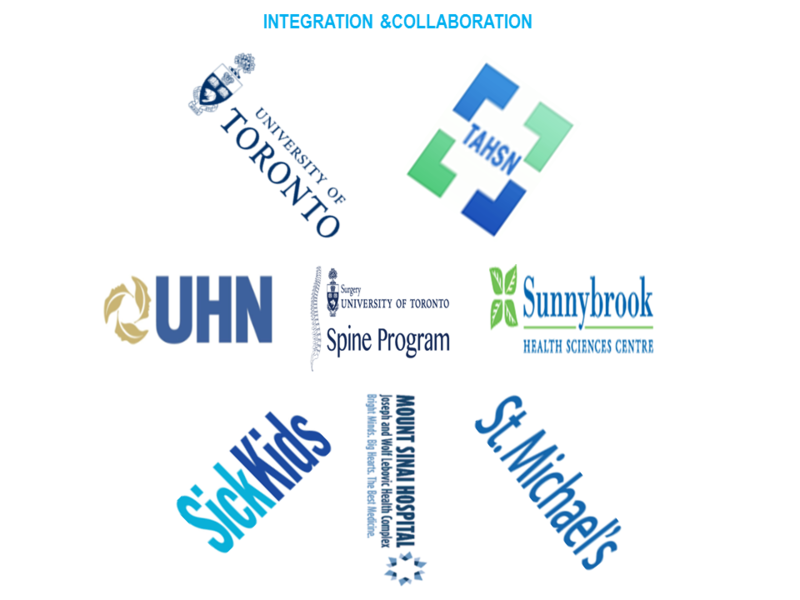 The Program, in collaboration with the UHN-TWH, was rated top-host site for last year’s Cervical Spine Research Society travelling fellows for the hospitality, and the excellent academic, research, and clinical program. We have also been selected as a host site for the Scoliosis Research Society (SRS) Traveling Fellows 2016 visiting Toronto end of this month. With Dr Fehlings’ lead, we are excited about taking part in hosting the Cervical Spine Research Society (CSRS) Annual Meeting and the instructional course on Nov 30th , and Dec 1st -3rd this year. The CSRS has collected over 500 abstracts this year the largest collection has been for this event. We have also been successful in our bidding to bringing in AOGlobal Spine Congress to Toronto in 2019. This event enables opportunities to leverage our global advocacy and outreach. In closing, thank you for all your support over the years. We are privileged to benefit from the diverse and specialized expertise of our program members. We are excited about updating our Strategic Plan later this year and look forward to continuing to work together to shape the landscape of spine academia at the University and beyond. Many thanks to Ms. Nadia Jaber, our program coordinator that has been instrumental in moving forward our collaborative agenda. Join us in welcoming our SpineFEST Keynote Speaker Professor Daniel Riew MD from New York. Dr Riew is a Professor of Orthopaedic Surgery, Co-Chief of Spine Division, and Director of Cervical Spine Surgery at Columbia Medical Center. His practice is exclusively limited to the operative treatment of the cervical spine, a rarity among spine surgeons. He is an engaging speaker and we all look forward to his wealth of expertise in the management of patients with complex cervical disorders.